How should I start my story? Too many questions without any answers. How can a happy family day turn into a tragedy? It is difficult and painful for me to write about the drowning accident. That was how we lost our beautiful boy one sunny day at a beach resort. Coupled with the grief I'm feeling right now, I'm still sorting through other emotions like the guilt, the regret, and the shame . The nightmare is still so clear in my mind like a movie that keeps replaying all over again. Concerned friends and relatives ask me what happen and sometimes it helps to share it . Most often, sharing my grief helps and I get a lot of comfort from it. Other times I don't want to talk about it because of what they might be thinking like " what kind of parents are you for allowing this to happen" and "how could you not have watched your boy?" (someone actually had the temerity to ask ) .All these emotions are part of our grieving process and I know there will come a day when I will be able to put my thoughts on how my little angel went to heaven. Contact Information : Email Noemi - mother of Luijoe at [email protected]- or contact me at my cellphone at +639178101582 if you want to talk about your grief. "And God shall wipe away all tears from their eyes, and there shall be no more death, neither sorrow, nor crying, neither shall there be any more pain; for the former things are all passed away" - Revelation 21:4"
Our 6 year old son, Luijoe (real name is Jose Luis) and the only boy among 3 siblings drowned while swimming at the pool of a beach resort on May 27,2000 at around 2:30 pm during one of our family vacations. On November 2005, or more than 5 years after Luijoe's death, I finally wrote about my feelings about his life and death. Luijoe's story is part of 22 stories in the book, "Fallen Cradle" , compiled by Agnes Prieto on the loss of a child . The book is available at National Bookstore. More details here. It has given me great comfort from our priest that since Luijoe died at a very young age, he's automatically a saint and an angel. At the age of 6 years old, Luijoe had no moral culpability and therefore never sinned. The priest reassured us that now Luijoe is close to God and that we can pray to our little angel to intercede for our needs if that is God's will. 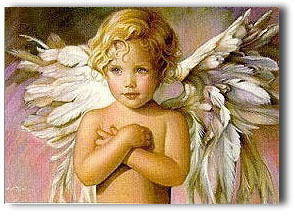 We are so blessed to have an angel who is close to us , who knows us and is now close to God. For more updates about our grief, please proceed to our updates page. Playing with the sand...an hour before he died. He died around 2:30 pm. This was the last time I saw Luijoe alive. My beloved and precious boy is gone.